If you would like to reunite with your common-law partner that is either living abroad or visiting you in Canada, then it is best to understand what a common-law sponsorship entails before attempting to submit your application. If you are a Canadian citizen or a permanent resident of Canada, you may be eligible to sponsor your common-law partner to Canada for permanent residency. Much like any other immigration application, there are specific eligibility requirements that must be met by the sponsor as well as the sponsored common-law partner in order to qualify. 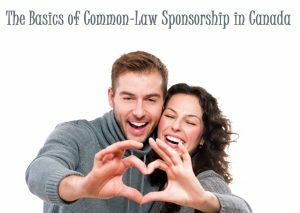 Therefore, in this article, I will address the most important information you should know about common-law sponsorships in Canada. According to Canadian Immigration, a common-law partnership is defined as an exclusive, marriage-like committed relationship between two individuals. Common-law partnerships are not marriages as the partners do not get officially married; however, what qualifies the relationship as marriage-like is that they continuously cohabitate with one another for a minimum of one year. It is important that the cohabitation be continuous as if there is any gaps, the relationship may not qualify as a common-law partnership. If there have been any gaps, the reasoning must be legitimate for Canadian Immigration to still consider the relationship. For instance, if the common-law partner’s visa expired or there was an illness in the family, then Immigration may understand the circumstances and recognize the common-law partnership. This is the most important aspect of the common-law sponsorship as you must ensure the sponsor can actually sponsor their common-law partner prior to applying for a common-law sponsorship. It is important to note that Immigration Canada analyzes whether the common-law partner is eligible to sponsor by examining whether the sponsor is financially capable of supporting the sponsored common-law partner for the length of the undertaking. The length of the undertaking for common-law sponsorships is 3 years. The reason why the Canadian government specifically looks for this in common-law sponsorships is to ensure that the sponsored common-law partner will receive any social assistance while residing in Canada. In order to sponsor your common-law partner to Canada, the sponsor must abide by the following eligibility requirements. If both partners meet the above eligibility requirements then the relationship qualifies as a common-law partnership. Additionally, in order to prove that the relationship is real and genuine, there are specific supporting documents that Canadian Immigration requests as well. Proving cohabitation by providing joint lease agreements, joint utility bills, etc. Of course, it is important to note that these are not the only documents that you should provide. As previously mentioned, it is extremely important for common-law partnerships to adequately prove their relationship, especially because they are not officially married. If you can think of any additional information that you think would support your application, it is highly suggested to present this to Immigration as it can truly help your application. Additionally, if there are any documents that need an explanation, you can also provide an explanation letter for the Immigration officer to better understand the documents.